← Retro Clean: seeing is believing! A. Create a design that moves the value from light in the central area to dark in the outer perimeter. This fabric was dyed by me during a workshop a couple summers ago. 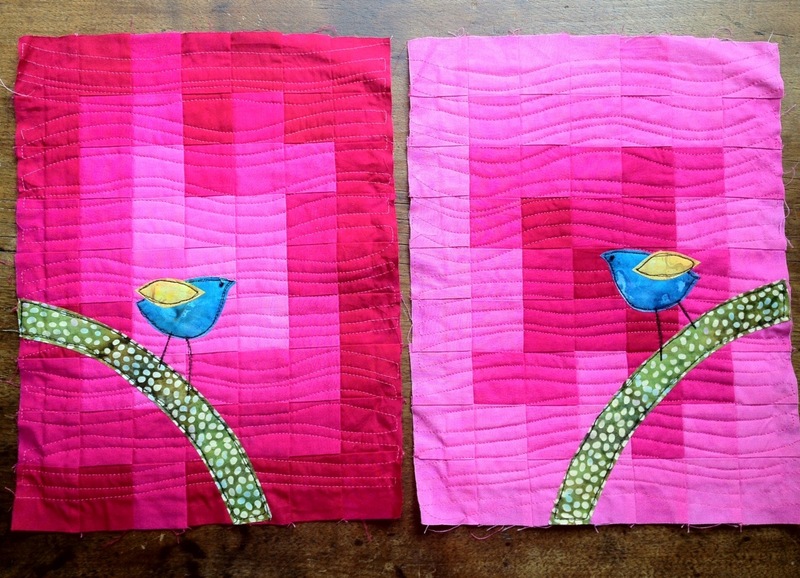 I had 5 different values of the same pink which I cut into 2 inch squares and then pieced together to make these backgrounds. I didn’t want to make absolute “bull’s eyes” so I mixed the square pieces up somewhat. The background was pretty heavily but easily quilted. 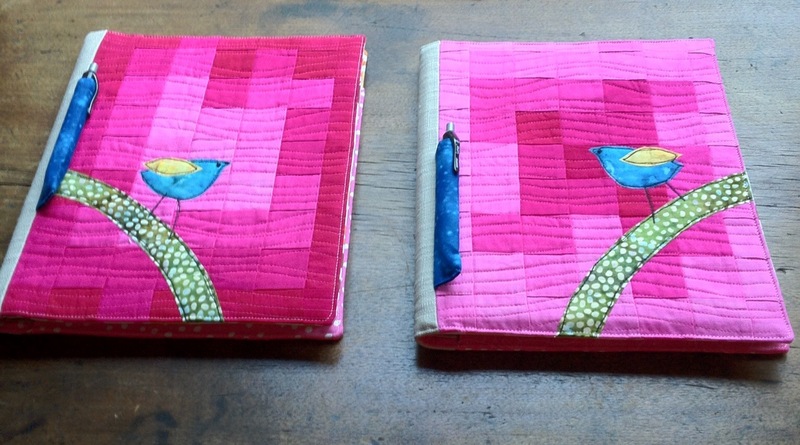 I then fused the little birds and the green “thing” they are standing on to the background and did a free motion straight stitch with black thread to the edges. The eyes are little black seed beads. I really like the look of this. I guess it looks sort of cartoonish. I wanted to make them into something useful so guess what I chose to do with them? Well, not EVERYONE I know has a notebook cover yet, so. . . . 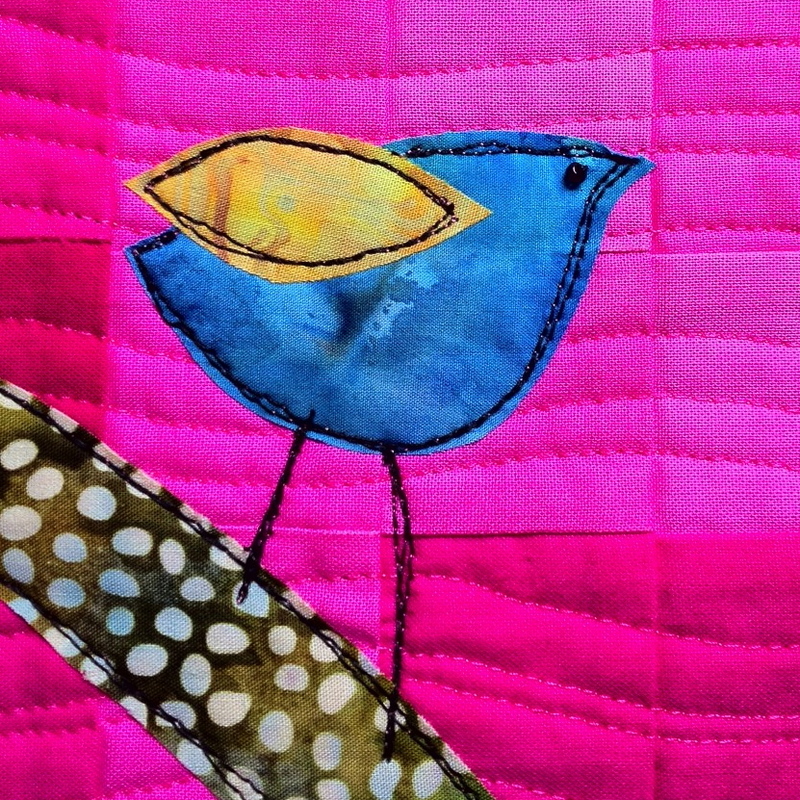 Linking up to Quilt Story’s Fabric Tuesday. Beautiful. They look lovely as notebook covers. Those are so cool. I want to try that color value technique. These are wonderful – do tehy apear somewhere on Flickr? I’d like to make them a favourite! !